Every adult started out as a child at one point. What do you remember? You valued different things. You thought differently. You experienced the world differently. Joy, hunger, pain, and anger affected you in more dramatic ways. You had a remarkably different body from the one you now inhabit. And yet, when it comes to massage, many people are surprised that children cannot simply be treated like small adults, rather than a unique population with their own special needs. Does training matter? Culture has long tried to convince us that working with children is something that should be instinctive, intuitive, and utterly natural. Unfortunately for many new parents, teachers, and care providers, this is often not the case. And especially in a medical setting, what “instincts” we have may in fact be inadequate or even harmful. There is nothing preprogrammed in any of us for working around a child’s IV or feeding tube. No matter how comfortable we feel interacting with children on a casual level, providing massage therapy requires another level of understanding. So given that high-quality education and training matters, why not learn from the best? 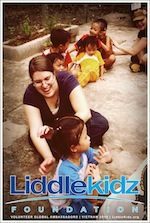 Tina Allen, founder of the Liddle Kidz™ Foundation, is a highly respected international lecturer, author, and authority on infant and pediatric massage. You might remember her as last year’s Massage Therapy Foundation Humanitarian of the Year for her work bringing pediatric massage to communities in need around the world. Allen will be offering a six hour class, The Many Benefits of Pediatric Massage, on Saturday, May 4, from 9am to 4pm. The class will include lecture, discussion, and hands-on learning, and will include information about massage for both healthy children and those who have been hospitalized or are suffering from serious or terminal illnesses. And of course, the latest research will be explored, showing the benefits, therapeutic applications, and contraindications for pediatric massage. The world is full of children. They all contain so much potential, but none will thrive without experiencing appropriate and caring touch in their lives. When providing pediatric massage, the future is truly in your hands. With the right knowledge and training, you can be sure you are working to make it the best one possible. Ready to register? Click here for easy online registration.